The first in a multi-part series. Planning for a Colorado climate lawsuit began at least one year prior to its filing, according to documents obtained through a Colorado Open Records Act request. The documents from Boulder County reveal an extensive timeline of coordination between three Colorado local governments and plaintiffs’ attorneys beginning in the Spring of 2017 and culminating with the lawsuit announcement three months ago in Boulder, Colo. According to a Boulder County staff member, the process of exploring potential litigation against oil and gas companies began when, “Boulder County was approached by Earth Rights International to become a plaintiff in this lawsuit.” According to Boulder County Commissioner Elise Jones, the Board of County Commissioners asked county staff to investigate a possible lawsuit with Earth Rights International (ERI), a Washington, D.C.-based law firm, on a pro bono basis. While the lawsuit against ExxonMobil and Suncor was officially announced on April 17, plans to move forward with a climate lawsuit, with the assistance of Earth Rights International (ERI), began approximately one year earlier, according to documents from Boulder County staff in the open records request, and publicly, from the county commissioners themselves. “We gave direction over a year ago to staff to explore such a lawsuit with Earth Rights International, and discussed it in our op-ed in the May 7th Daily Camera about our multi-pronged approach to address oil and gas development, and we’re delighted—I’m delighted—that the City of Boulder and San Miguel County are able to join with us in this effort,” Commissioner Jones said ahead of the Boulder County Commissioners’ vote on April 17th. In the board meeting that morning, the county commissioners approved a pro bono retainer agreement with the non-profit organization ERI and a contingent fee agreement with Hannon Law Firm, a Colorado-based firm. “I see this lawsuit as a really important step for us to take, but only one piece of a much larger set of solutions around climate change which indeed will take a multi-faceted strategy,” Jones said at the time. “Pursuing a lawsuit to hold industry accountable for the hazards and costs of climate change,” was listed as the thirteenth item in a laundry list of actions that included support of anti-oil and gas ballot measures and other local and national lawsuits targeting oil and gas development. It also included “organizing the Colorado Communities for Climate Action coalition [CC4CA],” which features prominently throughout the open records request. “As your county commissioners, we pledge to continue to use all legal means to protect this county and its residents from the impacts of oil and gas development and to forge ahead with a cleaner energy future for us all,” the commissioners wrote last May. In announcing their public support for the lawsuit 11 months later, in April 2017, Jones restated the board’s intent. “And cities and counties, frankly, can’t afford to pay these costs alone, we know that. And the two companies that we are naming in this suit have known about the dangers of climate change for over 50 years,” Jones alleged. Three days after the lawsuit was filed, an email from Susie Strife, Boulder County’s Sustainability Coordinator, was attached to that week’s CC4CA round up. It details the evolution of the lawsuit, which began with ERI seeking out a willing plaintiff, and the manner in which the City of Boulder and San Miguel County were brought on board. In a separate email response to John Fryar, a Longmont Times-Call reporter covering Boulder County government, Strife said Boulder County paid $14,000 for the study from Resilient Analytics. That report claimed $96 to $157 million in “costs of adaptation” for Boulder County through 2050. As Western Wire has previously reported, choosing a non-coastal community like the City of Boulder was intended to diversify the climate plaintiffs, which had until that point been concentrated in California coastal cities and part of the motivations expressed by the city council in its January 4th agenda, as the municipality “could perhaps not be more geographically different” from the California government plaintiffs. In her email, Strife indicates that the same motivation animated Boulder County’s analysis, as well as its intent to seek out a partner on Colorado’s Western Slope. “Given that a major intent of the lawsuit was to bring climate accountability to the interior of the country (as opposed to similar lawsuits already filed in coastal communities on both the east and west coasts), we wanted to include a western slope, rural county with a history of climate action that was also facing impacts of climate change, especially with regard to the ski industry. San Miguel County, which includes Telluride Ski Resort as an integral part of its community, naturally rose to the surface as an ideal partner,” Strife continues. In Strife’s recounting, the Boulder’s commissioners extended the invitation to join the lawsuit to the San Miguel County commissioners in March 2018. “The Boulder County commissioners initiated conversations with the San Miguel commissioners just last month, inviting them to join Boulder County and the City of Boulder in the legal complaint,” Strife wrote. By the April 20th CC4CA email roundup, Strife wanted all recipients to know that other municipalities and counties were still welcome to join the lawsuit. “BUT, there are still ample opportunities to join this lawsuit! We welcome any your communities’ interest in learning more about the lawsuit and potentially joining us as an affiliated plaintiff. We are waiting to hear back from Earth Rights International on the next steps, so please contact me if you think your community is interested and we can follow up with next steps,” Strife concluded. To date, no additional local government has joined the lawsuit. 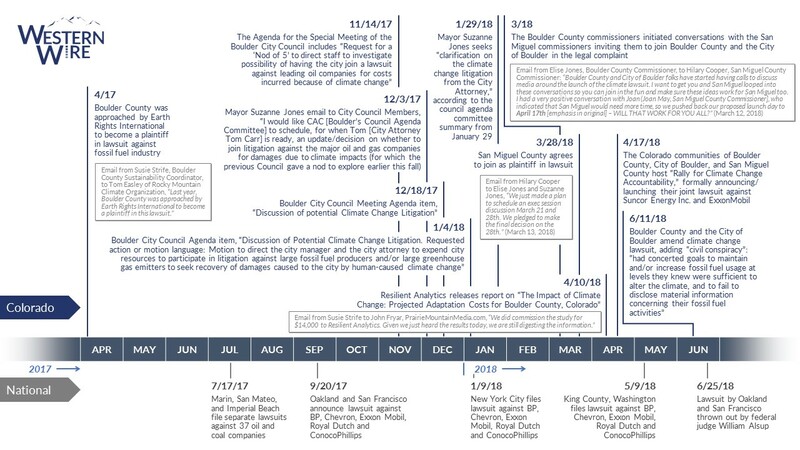 An earlier open records request from Western Wire to the City of Boulder in February revealed additional key dates in the Boulder climate lawsuit timeline. After news broke the previous month that Boulder City Council had opened talks with a then-unnamed Washington, D.C. law firm who was “shopping” a lawsuit, Western Wire asked for all emails and documents related to a potential lawsuit from city council officials and staff. An item from the council agenda committee summary dated January 29th disclosed that Boulder Mayor Suzanne Jones had asked the City Attorney’s Office for advice and “clarification” of the “potential costs and risk” of a possible climate lawsuit. Suzanne Jones is the twin sister of Elise Jones. The agenda noted that City Attorney’s Office “will send out a confidential memo with updated information regarding potential costs and risk” of the lawsuit. As early as November 14, 2017, the Boulder City Council considered a “Nod of Five” majority of the nine-member council to “direct staff to investigate the possibility of having the city join a lawsuit against leading oil companies for costs incurred because of climate change” at a special council meeting. The lawsuit, according to City Attorney Tom Carr, was to be brought by an unnamed law firm on behalf of the City of Boulder, pro bono, with other Colorado governments possibly signing on as well. That risk to taxpayers was not revealed until Western Wire’s open records request uncovered the retainer agreements in June. By December 3, 2017, in an email to her colleagues, Jones asked to schedule an “update” regarding joining the litigation. “Finally, one topic we neglected to cover (and I forgot to raise given the full agenda), was Boulder’s current and future role in helping further the national climate/energy conversation,” Jones wrote. “Specifically, it would be useful to hear updates on our engagement in defending federal policies such as the Clean Power Plan, as well as thoughts on other strategic efforts we should consider. To that end, I would also like CAC [Council Agenda Committee] to schedule, for when Tom is ready, an update/decision on whether to join litigation against the major oil & gas companies for damages due to climate impacts (for which the previous Council gave a nod to explore earlier this fall) [emphasis in original],” she concluded. The meeting agenda item was scheduled on December 18, 2017. Boulder City Council next discussed possible legal action in January 2018. The City of Boulder City Council agenda for January 4 included a “discussion of potential climate change litigation.” Jane Brautigam, City Manager, and Carr presented. “The purpose of the litigation would be to seek to recover the additional costs that the city has incurred and will incur because of human-caused climate change,” the agenda’s authors listed under economic impacts. The City of Boulder, like its counterpart, Boulder County, emphasized the importance of adding a non-coastal plaintiff to the roster of communities bringing climate lawsuits. In Carr’s November 14th statement to the council it is clear that the shopped lawsuit and as-yet-unnamed law firm sought to expand the narrative of climate lawsuits. “Obviously California is a coastal community; we are not. And so the who people have approached us are interested in branching out to other communities in the country who have different kinds of climate effects than those that are affecting the coastal communities,” Carr said. As Boulder’s Sustainability Coordinator, Susie Strife, indicated in the April 20th email to CC4CA, San Miguel County was a late addition to the lawsuit conversation. 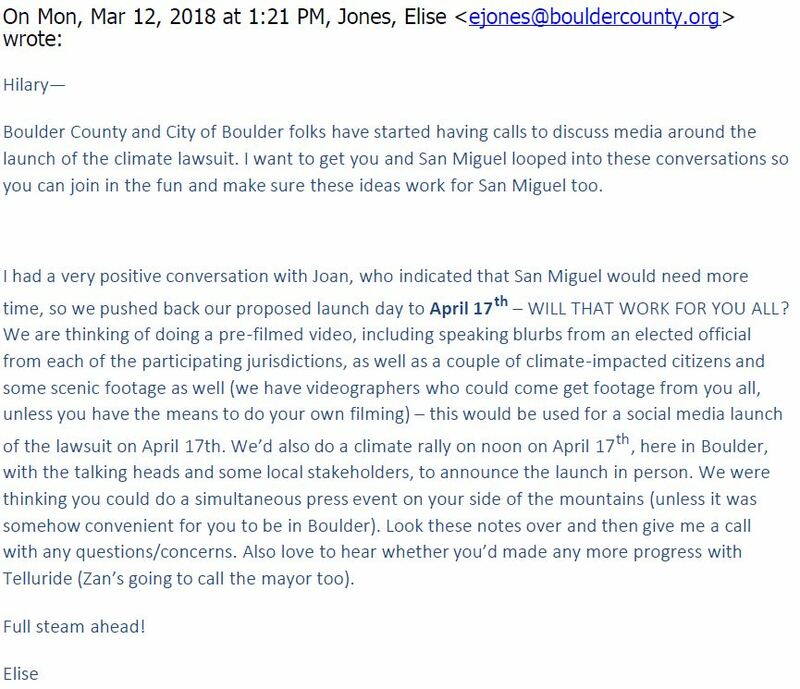 A March 12th email from Boulder County Commissioner Elise Jones to Hilary Cooper, San Miguel County Commissioner, acknowledges that the City of Boulder and Boulder County have already begun to plan a media strategy for the impending lawsuit, as well as a tentative date for the lawsuit’s announcement: April 17th. “Boulder County and City of Boulder folks have started having calls to discuss media around the launch of the climate lawsuit. I want to get you and San Miguel looped into these conversations so you can join in the fun and make sure these ideas work for San Miguel too,” Jones wrote to Cooper. San Miguel appeared to be need additional time, according to Jones, who told Cooper she had spoken to Cooper’s colleague, Joan May, another San Miguel County Commissioner. “I had a very positive conversation with Joan, who indicated that San Miguel would need more time, so we pushed back our proposed launch day to April 17th – WILL THAT WORK FOR YOU ALL? [emphasis in original],” Jones asked. Included in Jones’ email was a sketch of the activities planned for the April 17th lawsuit rollout. “We are thinking of doing a pre-filmed video, including speaking blurbs from an elected official from each of the participating jurisdictions, as well as a couple of climate-impacted citizens and some scenic footage as well (we have videographers who could come get footage from you all, unless you have the means to do your own filming) – this would be used for a social media launch of the lawsuit on April 17th. We’d also do a climate rally on noon on April 17, here in Boulder, with the talking heads and some local stakeholders, to announce the launch in person,” Jones wrote. The video was released by Boulder County commissioners on behalf of all plaintiffs on April 17th, just ahead of the press conference and rally that day. “We were thinking you could do a simultaneous press event on your side of the mountains (unless it was somehow convenient for you to be in Boulder). Look these notes over and then give me a call with any questions/concerns. Also love to hear whether you’d made any more progress with Telluride (Zan’s [Boulder Mayor Suzanne Jones] going to call the mayor too). Full steam ahead!” Jones concluded the email. 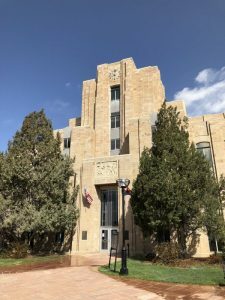 The joint press conference for all three governments—and not two separate press events—ultimately took place in front of the Boulder County Courthouse on April 17th. The next day, on March 13th, Cooper sent an email response to an inquiry from Jones to confirm an April 17th date for the lawsuit, asking if Cooper’s colleague May should be included on “media calls/emails” related to the conversation about litigation. “We just made a plan to schedule an exec session discussion March 21 and 28th. We pledged to make the final decision on the 28th,” Cooper wrote, referring to the San Miguel County Board of County Commissioners. “I have not broached the idea about participation with Joan yet and I want to give her time to consider the whole thing before I throw this out on top. So let’s proceed and I’ll bring it up on the 21st,” Cooper responded. Kris Holstrom, San Miguel’s third county commissioner, attended the April 17th climate lawsuit rally on behalf of the county.